New UN Human Rights report says total number of casualties in Ukraine since the conflict started close to 10,000. A new United Nations report out today has confirmed that Ukrainians living close to the “contact line” – the area between Government-controlled and armed group-controlled territory in the Donetsk and Luhansk regions – not only suffer due to fighting near their homes but also face the threat of landmines and unexploded ordinance as well as have to contend with severe restrictions on movement. According to the Report on the human rights situation in Ukraine launched today by the Office of the UN High Commissioner for Human Rights (OHCHR), between mid-August and mid-November, at least 32 civilians were killed in conflict-related incidents and another 132 injured. Between mid-April 2014 and 1 December this year, more than 2,000 civilians are estimated to have dined while an additional 298 were killed in the crash of Malaysian Airlines flight MH-17. Conflict-related civilian injures are estimated between 6,000 and 7,000. “It is of deep concern that Government forces and armed groups operating in civilian areas do not take all feasible precautions against the effects of fighting, resulting in damage to schools, kindergartens, and medical facilities,” noted the report. It added that it was worrying that Ukrainian military forces and armed groups continued to be positioned in civilian homes and buildings in villages and towns adjacent to the contact line. The report also raised concern that armed groups in the self-proclaimed “Donetsk people’s republic” and “Luhansk people’s republic” continue to deprive people of their fundamental rights as well as of effective mechanism for redress. Hundreds of individuals also remain missing. While some of them could be dead with their bodies not yet recovered or identified, “some individuals considered missing by the Government may be held incommunicado in territories controlled by the armed groups or vice versa,” noted the report. It also drew attention to a number of penal and pre-trial detention facilities in the armed group controlled and that despite repeated requests, UN human rights monitors were not allowed full and unhindered access, raising concern that those kept there may have been subjected to torture or sexual and gender-based violence. Furthermore, disproportionate restrictions on freedom of movement across the contact line severely affect an average of 25,000 people per day, dividing families and communities. The report also noted that agricultural land contaminated by landmines and other unexploded remnants of war had further aggravated the suffering of the population and those internally displaced continued to face challenges in availing of social security and pension payments. According to the UN human rights office, the total death toll from mid-April 2014 stands at 9,758 with another 22,779 people injured. These figures are estimates and comprise members of the Ukrainian armed forces, armed groups and civilians. 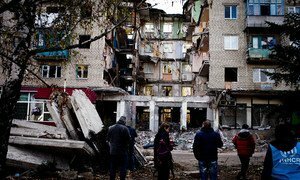 The impact of the conflict in eastern Ukraine on the human rights situation illustrates the need for the full implementation of the provisions of the Minsk Agreements, the report states. A new United Nations report released today shows a 66 per cent increase in the number of conflict-related civilian casualties in eastern Ukraine and describes the deterioration of the human rights situation there, as a result of escalating hostilities between the Government and non-Government forces from June to August.